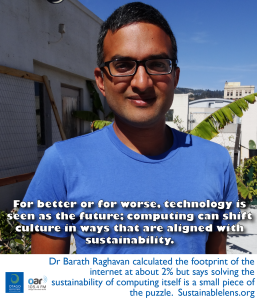 Dr Barath Raghavan is a researcher with the International Computer Science Institute in Berkeley, California. We discuss how he brings together his research in networking and passion for sustainability – particularly gardening. I struggle that computing as a field is about virtual worlds…creating everything in an abstract space, computer programs have no physical boundaries – at least this is how computer scientists like to think of it. Yet at the same time…I’ve had concerns about energy and environmental issues. Those were always two distinct interests – I have my computing interests and I had my environmental interests, and they never crossed. A formative experience at elementary school was an Earth Day…50 simple things kids can do to save the earth…awareness things. (Little things like recycling) It’s the easiest thing, it’s immediately apparent, and you think you’ve done something…the danger is if that’s all you do. (4 environmentalisms) if it’s all light green we’re not going to make any progress. Networks in a broader sense – understanding how things interlock in systems. That connects to ecology in ways that I hadn’t anticipated. Donella Meadows’ leverage points – how to effectively change large scale systems – she was a systems ecologist, but her principles apply equally well to how would we change the internet. Thinking about one system helps you think about others. My hope is that I can bring more computing systems thinking people into the fold of thinking about ecological problems. Modularity based on abstraction is the way that things are done…(Liskov)…we have computer systems built on a scale that would have been unfathomable only a couple of decades ago – the internet may be the single biggest system humans have ever built – and this system wouldn’t work with modularity, the ability to divide up the problem, and abstract it to simplify the way two different systems plug into each other…but now computing is so embedded in society it is important that we understand not only the upsides of modularity and abstraction, but also the downsides. What happens when you get too much complexity in a system? (Are our systems too fragile?) Optimist: the reason the internet is so stable is that there are enough feedback loops, people who’s job it is to fix it. Pessimist: there are too many weak points, in interests of efficiency, we’ve engineered out all of the redundancy. We’ve seen examples of both of these perspectives being right. Razor-thin margins require resources to run just-in-time. Will we be able to maintain that as we become more resource constrained? With embodied energy and electricity consumption, the internet accounts for something like 2% of global energy consumption. The easiest thing we could do is keep devices longer, next we should really use computing to help save energy in other aspects of society. The fundamental issue is that the economic system is structured for obsolescence and growth – so if people were to keep devices for as long as possible, it would have ripple effects throughout the entire economic system. Effective environmental thinking requires a restructuring of societal priorities. (Tomlinson) Sustainability is a cultural issue, not a technological issue. So computing can only really help solve problems we as society decide are important enough to solve. (so are we wasting our time?) It is natural for computing to want to be involve. Shower timers, reminders to recycle aren’t going to make a difference, but……effect of drought reminders in California….small shifts in thinking will eventually add up, and this is where social change comes from. So there is some small value in doing the small things, the problem is when we only do the small things. We need to go beyond the small concrete goal to broader systemic change. Computing in the the Long Emergency…there are ecological limits that we’re facing, they’re likely to take a number of different forms rather than a single event, and they won’t happen all at once, they’ll play out of the course of a century…we’re seeing that right now…so how does computing have to contribute? how are we going to be affected? Computing research is driven on the promise of more, the promise of progress, new prosperity through new invention. This long emergency future might make it impossible to have that better tomorrow future – it might be making do with less…At best the science and technology research will help us more gracefully go downhill, rather than falling off a cliff. (How might computing learn from the positive demonstration of a better life, seen in the Transition Town movement?) The ability to communicate with people all over the world…we don’t know what we’re doing, its a giant planetary experiment, the best we can do is share what seems to be working…communication technology is pretty important for that. The structure of the computing industry, like any industry, is about making profits, and that is not aligned well with the sorts of responses and solutions that sustainability minded people have identified. Solving the sustainability of computing itself is a very small piece of the puzzle, it’s about using computing to make society more sustainable. (Technology utopia or slow/fast decline?) I still think that a gradual decline is on the cards. I don’t believe that we can wriggle out of what ecology tells us – that we’re in overshoot, humans are exceeding the carrying capacity of the planet, so something is going to have to come down: our resource consumption, our industrial base, probably many things will come down…but I don’t think that many of the things we take for granted as part of everyday life are necessary for happiness. This is what the Transition Town movement identifies – you can still have a rich life, a happy life, without a materially wealthy life. The difficulty I have, is that so far I haven’t seen evidence from a broader society that we collectively make good political decisions, the rules that we apply to ourselves, we haven’t figured out that we have to make decisions that have short term painful consequences for long term benefits. We have to slow down the rate of resource consumption now so that we can have reduced climate change in the future. That’s where my worry lies – I think we will still have a slow decline, but the nature of that slow decline..will it be a harsh slow decline or will we come up with an alternative system that mitigate that decline? I believe in community oriented responses. In 50 years in the future, will we still have resources to run the internet? I’ve thought about this quite a bit, we wrote a paper Macroscopically Sustainable Networking: An Internet Quine (a Quine is a program that can reproduce itself)…do we have the knowledge, resources and machinery to rebuild the internet using local resources? Or do we really need the global industrial system to keep the internet going. A simple answer is that we have enough waste – chips sitting in landfill – to keep the internet going for a very long time. A more complex answer is that a lower bandwidth internet is certainly easy to do. The other question is will it be useful for society that people will care? (Concerns about food production leads to local resilience activities such as farmers markets, community gardens and guerilla gardening…is guerilla networking possible or desirable?) Yes, I’m involved in several such projects. (Success? ): Tree planting. Working with a lot of businesses to plant fruit trees. (Activist? ): I don’t know, I’ve never thought about it. It would be fair to say that I am, but I do keep my activism separate from my research – that’s the traditional way, although these days I feel I am allowing the two to converge. (Motivation? ): Growing things. Looking for opportunities to plant something almost every day. (Challenges? ): Figuring out how what I think is worthwhile is Research, with a capital R. What is defined as research…a professor here likes to quote “researchers get paid to be clever, not to be right”, I’d like to be a little bit clever and a little bit right. I’d like us to do work that is important, but also come up with new ideas that are useful to society. Thinking about how to convince a research community that is designed around novelty, rather than societal impact – that’s a challenge. (Miracle? ): I would implement some version of Herman Daly’s steady state economy. (Advice? ): Read something that if far afield from your field, something from some other discipline. Although recorded in Barath’s rooftop garden in Berkeley, this Sustainable Lens is from a series of conversations at University California Irvine. Sam’s visit was supported by the Newkirk Center for Science and Society, and coincided with Limits 2015.